President Jacob Zuma's announcement that Pravin Gordhan has been appointed finance minister and David Van Rooyen Cooperative Governance and Traditional Affairs Minister, days after he took the job at Treasury, was met with disbelief on Sunday. While the president says he is listening to citizens, calls for him to be recalled continued. By GREG NICOLSON. Democratic Alliance (DA) leader Mmusi Maimane said Zuma’s sudden change was an admission he acted recklessly by removing former Finance Minister Nhlanhla Nene last Wednesday. He said the president had lost control of the African National Congress (ANC) and called for citizens to voice their concerns through the ballot box. The DA welcomed the return of Gordhan to the Treasury and called on him to show restraint towards controversial issues regarding South African Airways (SAA) and the nuclear procurement process. Noting three people have held the position of finance minister within a week, the Economic Freedom Fighters (EFF) said the president has admitted South Africa is a joke. “If anyone still does not think we are in a banana republic, they cannot be helped,” said spokesperson Mbuyiseni Ndlozi in a statement. The EFF is calling for Zuma’s immediate resignation. “Zuma is a humiliation and disaster for South Africa, who prioritises personal aspirations at the expense of the country. The ruling party should now appreciate that the country is more important than the personal interests of one individual,” Ndlozi continued. United Democratic Movement President Bantu Holomisa said, “Zuma has lost control. It’s clear that he has been told that the decision he has made is costing the country.” Holomisa said the ANC is panicking and should immediately recall the president, but he also said that was unlikely. Former Reserve Bank Governor Tito Mboweni last week did not want to comment on the appointment of Van Rooyen, but on Sunday night he said he had already spoken to Gordhan and was told the new finance minister was ready to return to his job and take up the challenge. “I think it’s a very good decision on the part of the president to reappoint ‘PG’ as minister of finance,” said Mboweni over the phone. As the currency and markets suffered after Zuma replaced Nene with Van Rooyen last week, the president was criticised for sacrificing the country’s economic stability. Amid public outcry, the presidency released statements saying the state will continue its values of fiscal responsibility, denied rumours of more cabinet shuffles, and denied rumours Zuma had a personal relationship with SAA chairperson Dudu Myeni and that the alleged relationship had influenced his decisions. “As a democratic government, we emphasise the importance of listening to the people and to respond to their views,” Zuma’s Sunday statement said. Critics, however, have not been impressed. Former Sunday Times editor and columnist Ray Hartley on Sunday night called the latest decision the end of “Zuma politics”, which he said was prioritising “greedy backers”. “Zuma has lost his political aura and now the vultures will circle ever more tightly and the possibility of an early recall looms large,” Hartley wrote. Looking at the economic impact of the announcement, Global Investment Strategist at Standard Bank Wealth and Investment, Chris Hart, said Gordhan’s appointment will help weather the short-term but not long-term challenges. “Fortunately Gordhan has the gravitas and the track record and all the rest of it to inspire some confidence for the short-term,” he said. But the former minister implemented policies that increased debt, saw the rand fall, and increased regulation on the financial services sector leading to downgrades on SA’s economy, he cautioned. Activist Zackie Achmat, who has been a vocal critic of the president, on Sunday said he felt like singing, “Oh what a circus, oh what a show”. “The bigger tragedy now is that the economy will not recover easily,” Achmat said. He called for pressure on the president to be recalled to increase and said the announcement shows that some people in the ANC still have power over his decisions and should start using it wisely. Achmat pointed out another challenge of the reshuffle. The president said Van Rooyen has “been mandated to take forward the Back to Basics programme and further improve cooperation between the three spheres of government” as cooperative governance and traditional affairs minister. Gordhan’s deployment to the post was seen as sending an effective official to a troubled sector. 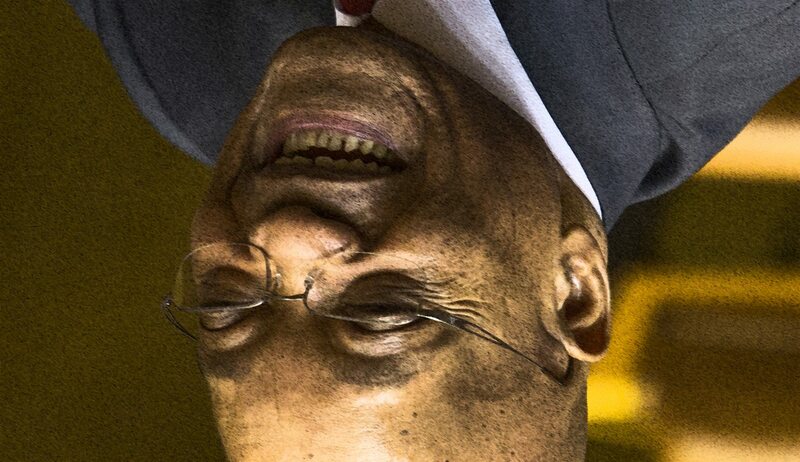 Original photo: South Africa’s President Jacob Zuma laughs before answering questions about his State Of The Nation Address (SONA) in parliament in Cape Town, South Africa, 19 February 2015. EPA/NIC BOTHMA.